Most audio books from Audible.com are under DRM protection and prevent the owner playing them on portable audio players. 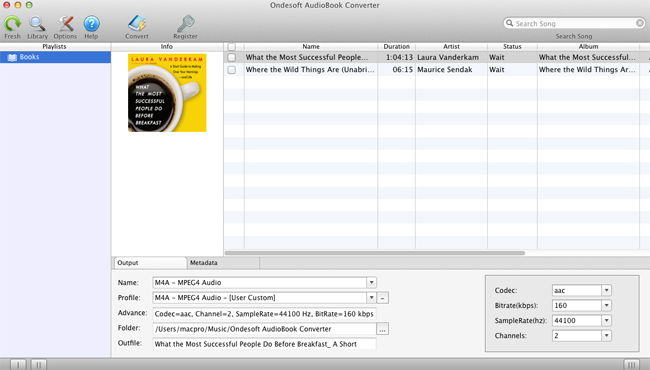 If you really want to break this DRM limitation and enjoy Audible audio books anywhere you want, this Audible AduioBook Converter for Mac will do you a big favor. Designed to convert all kinds of audiobook such as .AA, M4A, M4B to popular MP3 and AAC formats to play wherever and whenever, Audible AudioBook Converter for Mac brings you high quality DRM free audio books by recording them in the background and save them to MP3 or AAC at the same time. 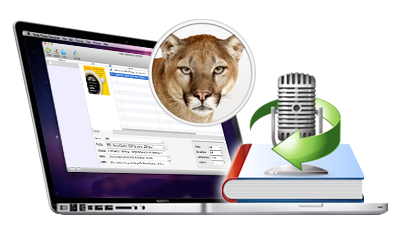 Audible AudioBook Converter for Mac is capable of converting any audio book that could be played on iTunes to multiple formats, including MP3, AAC and M4A. Audio books from Audible and iTunes store are under DRM protection and cannot be played on portable players; Audible AudioBook Converter will remove DRM from all kinds of audio books. Some Audible audio books can be very long, but it won't take you much time to convert these Audible audio books, since Audible audio books are converted at up to 16X speed. Too much Audible audio book to be converted and don't want to wait? That's easy: one click to select them all and convert in batch. Sit back and just enjoy the converted Audible audio books later. If you set MP3 or M4A as output format, ID tags of Audible audio books will be saved to the converted files. Converted M4A files will be divided by chapters as the original Audible audiobooks.